Surrounded by trees, and situated next to the JJC Lake in the heart of Main Campus, sits the Cronin Schoolhouse — a building that holds more than 150 years of history, memories, and stories. On May 7, 2013, the Joliet City Council declared the schoolhouse a local landmark, and the Will County Historic Preservation Commission gave the building its annual preservation award. Today, the one-room schoolhouse serves as a living history museum that hundreds of elementary school children visit each week. The Cronin Schoolhouse was not always on JJC’s property. It was originally built around the current intersection of Shorewood’s Route 59 and Black Road in 1863. Back then, an Illinois law required a schoolhouse for every four by four square mile region where at least eight school-aged children were living. Schoolhouses were usually built on a local farmer’s property. When residents first discussed the location, a few other areas were mentioned. But one site was too low. Another farmer did not want the schoolhouse on his property. It wasn’t until Farmer John Cronin volunteered his land that the schoolhouse had found its home. That’s why the building is called the “Cronin Schoolhouse.” Quite often, schoolhouses were named after the person who donated the land. The Cronin Schoolhouse became the eighth school built in Troy Township, and therefore District #8. In that township, the districts were numbered in the order that they were formed. The Cronin Schoolhouse, like all other one-room schools, catered to children in grades one through eight. The school year began in September and continued through May. In the winter, it was the teacher’s job to come in before students arrived to heat up the building. In its early days, the Cronin Schoolhouse had a potbelly stove. Many years later, a furnace was installed. To heat the furnace, teachers would use coal and corn cobs. Sometimes, the teacher would let the furnace burn overnight on a very low flame. If the flame didn’t blow out, the room would still be warm the next morning. The schoolhouse had a water pump located in front of the building. One student would bring a bucket to the pump and fill it with drinking water to share with the rest of the students and teacher. In the later years, students would walk out to the pump themselves and fill paper cups with drinking water. There was always a piano in the schoolhouse. Because the pianos often sat on the walls of the schoolhouse, they wouldn’t last for very long. The Cronin Schoolhouse obtained many pianos throughout the years from community donations. Children were taught in ten-minute intervals. The teacher would start off teaching the first graders, and go in order until all grades had been covered. Then, the teacher would start over again. Sometimes not all grade levels were represented. In many instances, there were only one or two students per grade level. When the students finished their ten-minute lesson with the teacher, they’d busy themselves with “seatwork,” and practice the lesson until the teacher came back to them again. In some instances, the older students would help teach the younger ones if they were having trouble. Some parents did not like their children teaching the others, but it turned out to be beneficial to the older students, with many of them going on to become teachers themselves. Subjects included: reading, writing, arithmetic, language, history, geography, physiology, art, music (to some extent, if the teacher enjoyed it), and in the later years, science. Students had a very basic learning experience. There were no honors classes. Oftentimes, the teacher would not know much more than what he or she was teaching the students. Many older boys in the community would not attend school because they were needed on the family farm. In the winter, however, many would go to school. Reportedly, many of these boys did not take school very seriously, and were often the biggest troublemakers in class. If there were a lot of extra pupils in the winter, in certain cases the teacher’s pay would slightly increase. In addition to teaching, the teacher’s job included school nurse responsibilities and janitor duty. If the teacher was sick and couldn’t make it to school, there would be no class on that day. If the teacher were sick for an extended period of time, a substitute would be hired. Though the Cronin Schoolhouse’s main purpose was for learning, after hours the building served other purposes. For example, during World War I, citizens could purchase war bonds at the Cronin Schoolhouse. School elections would also take place there. This was before the school elections overlapped with the political elections. One person was assigned to go to the school, light the lanterns, and start up the furnace to prepare for the voters; however, in many cases, nobody would show up to vote. Before 1915, cloakrooms for the students were located inside the school, and ran along the south end. In 1915, an entryway was added to the front of the building for students to hang up their coats. Boys and girls hung their coats on opposite sides, and always entered the schoolhouse from their side. Sometime between 1910 and 1920, a teacher named Nellie Cronin taught at the schoolhouse. Nellie was the granddaughter of John Cronin, whom the school was named for. In the winters, when there was deep snow, Nellie’s brother would drive her there in a bob sleigh. On other occasions, Nellie would ride her horse. During that time, female teachers were only allowed to teach until they married, which Nellie did. One-room schoolhouses might have disappeared earlier in the United States if it hadn’t been for The Great Depression and World War II. The lack of funds stalled the building of “better,” elementary schools, some of which are still scattered around the area and used today. During World War II, money wasn’t the only shortage. Teachers became scarce after many men went away to war. This was when it became acceptable for married women to teach again. This is what Nellie Cronin did – now, as Nellie Lapming. 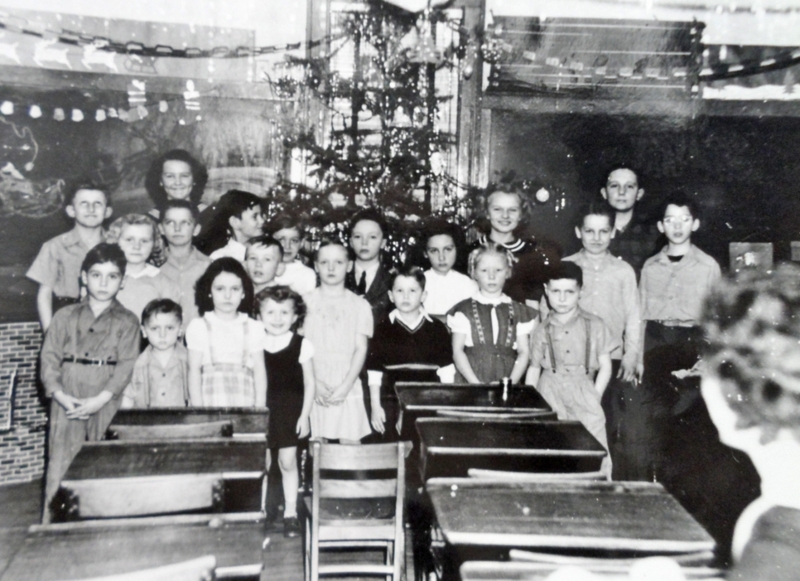 Before returning to the Cronin Schoolhouse, Nellie taught at another schoolhouse near Essington Road and Caton Farm Road in Joliet during WWII. In 1945, Nellie was offered a position at the Cronin Schoolhouse. She accepted. This time, Nellie drove a car, and she brought along her nephew, second grader John Cronin. Her nephew had been taking classes at St. Raymond’s in Joliet and was transferring to the Cronin School. Nellie picked him up because his home was on the way to the school. Nellie enjoyed teaching her nephew, and the eight other students who were in the class. Because many students were used to discipline at home, many did not misbehave in class because they knew the consequences. One of the most severe forms of discipline could result in a public beating in front of the class. In the 1940s, there were two highlights of the year: the Christmas program and the End-of-the-Year Picnic. Nellie and her students would begin preparing for the Christmas program the day after Halloween. The Christmas program would include an after-school show put on for parents and grandparents. Some students would sing Christmas carols, others would speak about the holiday, and sometimes there would be a play with a small group of kids. Coffee would be available to parents and grandparents as refreshments. Though the schoolhouse was around until 1950, there was never any indoor plumbing. If a student or the teacher needed to use the bathroom, they would have to go to the outhouses behind the school. When the Cronin Schoolhouse shut down in 1950, students went to the new Troy Consolidated District 30C schools. The school district then sold all the Cronin Schoolhouse items at an auction. The Larkin family purchased the building, and turned it into a home for rent. One family rented the home for several years. After the Cronin Schoolhouse closed, Nellie went on to teach first grade at an elementary school within the Troy Consolidated District 30C. For a short time, she also served as principal there. 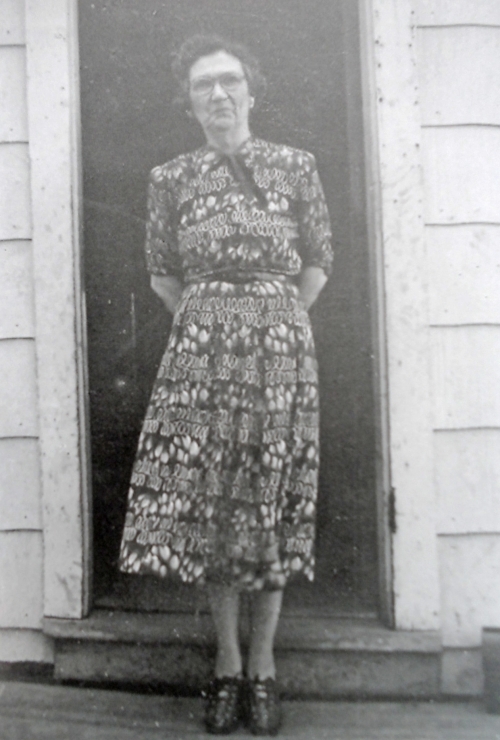 Another notable teacher at the Cronin Schoolhouse was Marie Ghilain, who taught in the late 1920s. Marie’s son, Russ Ghilain, currently volunteers as a tour guide at the Cronin Schoolhouse. Nearly 20 years after the Joliet Junior College Main Campus was built on Houbolt Road in Joliet, two agriculture professors, Jim Shinn and Dave Cattron, had a vision of their own: they wanted to bring a one-room schoolhouse to campus to serve as a living history museum. They wanted elementary students to come to JJC on field trips and learn about rural school living. But where would they find such a schoolhouse? The Cronin Schoolhouse, used from 1863-1950 and owned by the Larkin family in the late 1980s, was the perfect candidate. The school was sitting near the intersection of Black Road and Route 59 in Shorewood, and hadn’t been used since the Larkins had rented it out as a home from the 1950s through 1970s. When Ed Larkin found out about Shinn and Cattron’s vision, he donated the schoolhouse to JJC. But the work was far from over. The two men, along with many helpers (two of which included John Cronin and Ed Myers), took the time to research, renovate and construct the building at its new location across from the agriculture building on JJC’s campus. After finding the right company to move the building, a concrete foundation was created for the new school to sit on. Windows were replaced. A new layer of white paint was applied. Period desks and classroom equipment were bought and placed inside the building. Conveniences, such as heating and air conditioning, were also installed. The entire project cost approximately $11,000, and was funded by many private donations. After almost four years of planning and renovating, the Cronin Schoolhouse opened its doors as a living history museum in April 1991 on the JJC Main Campus. Today, elementary students from around the area continue to visit the Cronin Schoolhouse on field trips. Many combine visiting the museum with a trip to the Herbert F. Trackman Planetarium at JJC. A field trip at Joliet Junior College to visit the historic Cronin Schoolhouse, the Herbert F. Trackman Planetarium, or the JJC Nature Trails will give students an educational experience to remember for years to come. At the Cronin Schoolhouse, students will travel back in time, and find out what it was like to be a one-room schoolhouse student in Will County between 1863-1950. Students will learn about local history, but also get a general feel for life as a student in the United States more than 60 years ago. At the Herbert F. Trackman Planetarium, students will go on an animated “trip,” and learn about different subject areas in astronomy – including lessons about the solar system, Mars, the possibility of aliens and more. Depending on what time of year the field trip is booked, students will learn something different about the universe. Teachers and students also have the option to hike through the JJC Nature Trails, where they will be exposed to the natural beauty of the prairie and forests. Wild animals, including squirrels, raccoons, skunks, deer and different species of birds live along many areas of these trails. The JJC Nature Trails include the paved Rock Run Trail (2.75 miles), the unpaved Forest Trail (1.3 miles), and the unpaved Prairie Trail (.5 miles). To book a field trip at JJC, contact Field Trip Assistant, Gina Foote by phone at 815-280-2525 or e-mail at fieldtripcoordinator@jjc.edu. Field trip days are Monday, Wednesday, and Friday throughout the fall, winter, spring, and summer. Most teachers usually book these field trips ahead of time in August. Teachers should book their field trip at least two months ahead of the desired date. Field trips are not only limited to teachers and schools. Other organizations of 10 or more can book trips as well. Senior groups, YMCA groups, Girl Scout or Boy Scout troops, and daycare centers have been among the other groups who have booked a day at JJC. Any group or organization is welcome to book a trip.